Schedule blackout dates are those dates on which schedules will not run and cannot be set to run. A user authorized to access the Blackout Date tool can view, define, update, and delete schedule blackout dates. To view schedule blackout dates, in the Console, select Blackout Dates. The Schedule Blackout Dates interface, shown in the following image, provides a calendar and a list of groups to which you belong in the left panel. The right panel displays a list of schedule blackout dates for the selected group	. Authorized users can set and manage blackout dates globally, affecting all ReportCaster users, or exclusively by targeting specific user groups. The group list in the left panel shows the groups to which the user belongs. The Blackout Dates interface provided in the Blackout Dates tab. 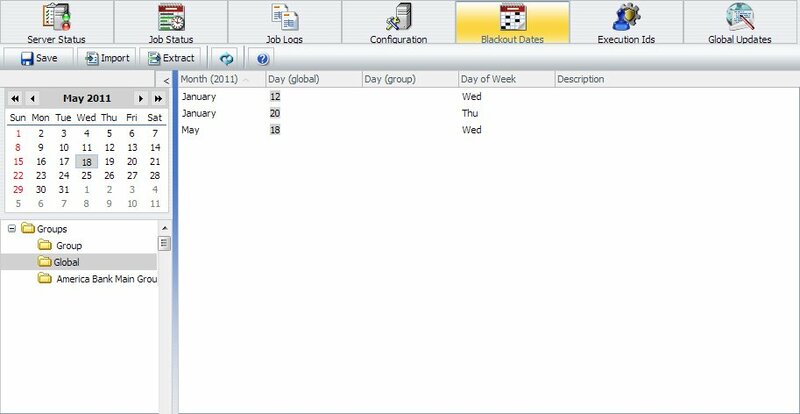 This interface provides an interactive calendar through which you can select blackout dates, and a list of groups to which you can assign blackout dates. The Import Dates utility, accessed from the Blackout Dates tab. The Extract Dates utility, accessed from the Blackout Dates tab. To view the schedule blackout dates for a particular group, select that group in the left panel. The list of blackout dates in the calendar and right panel refresh to display the selected group blackout dates, which are shaded in yellow, along with the global blackout dates, shaded in gray. You can change the month or year using the arrows at the top of the calendar. Click Refresh to load the latest blackout dates. Dates only appear as available or unavailable. You can toggle between exposing and hiding the left panel by clicking the arrow in the top-right corner of the panel. The following image shows the display with the left panel hidden. When creating or editing one of the date fields in a schedule, ReportCaster	dynamically checks the first upcoming date on which the schedule will run to ensure that this date has not been blacked out. If there is a conflict with the date, an error message appears and the schedule cannot be saved until the conflict is resolved by either changing the schedule date or by not blacking out the date. At run time, each schedule is checked against the list of blackout dates. If a blackout date has been defined for the scheduled date, the schedule will not run. If notification is enabled, a notification is distributed indicating that the schedule did not run because of a defined blackout date. Note: Schedule blackout dates for a specific user include the global blackout dates and the blackout dates assigned to the group(s) to which the user belongs. In the left panel of the Blackout Dates tab, select the group for which you are defining blackout dates. Note: Only authorized users can set Global schedule blackout dates. In the calendar, click on the dates that you want to black out. Click the single arrows to change the month and click the double arrows to change the year. If you are choosing global dates, the day on the calendar turns gray. If you are choosing a group blackout date, the day on the calendar turns yellow. The following image shows an example of group (August 11, 19, and 30) schedule blackout dates. A confirmation window opens to tell you that the dates have been saved. The blackout dates you saved appear in the Schedule Blackout Dates calendar and are displayed in the right panel. You can import a file that contains blackout dates into ReportCaster. 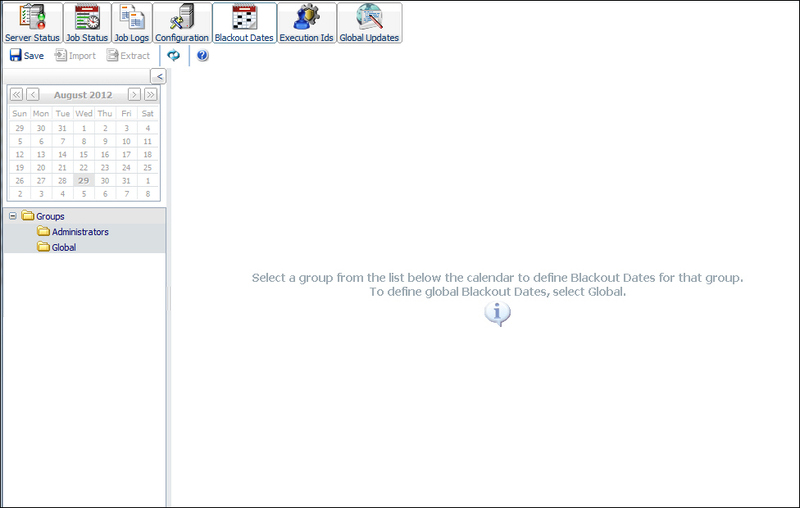 In the Blackout Dates tab, select the group for which you are importing blackout dates. On the toolbar, click Import. The Import Dates dialog box opens, as shown in the following image. In the File Name field, type the full path to the file, or click Browse and navigate to the file you want to import. Add. Adds the dates specified in the import file to the blackout dates. Remove. Deletes the dates specified in the import file from the blackout dates. Replace. Updates the description of the specified dates. Use the actions specified in the file. Use this option when the import file contains a combination of commands (add, remove, replace) and date ranges. Blackout Dates have been successfully imported. Select Save on the Schedule Blackout Dates toolbar to save the changes. In the Schedule Blackout Dates option menu, click Save. Note: The imported blackout date changes do not take effect until you save them. In the save confirmation window, click OK. The Schedule Blackout Dates calendar is updated with the blackout date changes. You can extract existing blackout dates in the ReportCaster	Development Interface to a .txt file. On the toolbar of the Blackout Dates tab, click Extract. The Extract Blackout Dates dialog box opens. The group name from which you are extracting the blackout dates appears at the top of the dialog box, as shown in the following image. All to extract all currently saved blackout dates. Date Range to specify the range of dates with blackout dates that you want to extract. If you select Date Range, type or select the Start Date and End Date. To select a date, click the down arrow next to the field. A calendar opens, as shown in the following image, from which you can choose a date. A window opens, asking if you want to open or save the file. If you choose to open the file, a window opens, displaying the contents of the extracted content. The following is an example of the data in an extracted file. In the Save As window, browse to the directory where you want to save the extract file and click Save. Note: The default extract file name is rcbdextract_GroupName_YYMMDD_HHMMSS.txt, where GroupName is the name of the group from which the blackout dates are extracted, YYMMDD and HHMMSS are the date (year, month, day) and time (hour, minute, second) that the file was created.